Typically brilliant, gripping writing. 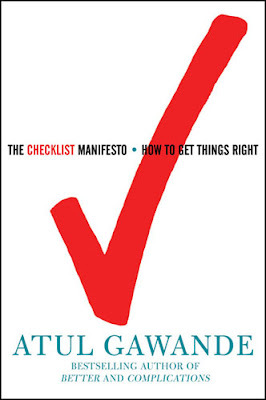 Articulates forcefully the stunning efficacy of checklist as a means of reducing preventable errors, everywhere. Drags a bit in the middle though. But succeeds overall. The book talks about the increasing complexity that is becoming the norm in most professions. Where complex operations are involved, from surgeries to flying an airplane to building a 1000 feet skyscraper, the knowledge needed to perform these tasks successfully exists. But it is the sheer complexity and the number of tasks that have to be performed that leads to failures. Failures because among all the hundreds of tasks that have to be performed by the dozens of people, one single task gets overlooked. The key lies in the ability to divvy up the tasks between the specialists, and then be able to monitor and track these individual tasks as they relate to the whole. Project plans are the norm in building projects. They are less often followed in the medical profession. For two reasons. The first is that medicine is a complex as well as a complicated profession. Not only are the steps required to accomplish a procedure many and difficult in themselves, but they can vary from patient to patient. The second is that in medicine, when you err, a patient may fall ill, or not recover in time, or at worst, die. In the case of airplanes, hundreds of passengers will most certainly die if complex procedures are not done right. In buildings, if the construction has not followed all applicable rules and guidelines, thousands could die. There are quite a few stereotypical myths that are demolished. Specifically, three of them. The first is of the surgeon as the solo artist who sweeps into an operating theater and with a wave of his magical hands puts things right. Not quite true. The second is of the master-builder who knows everything about constructing a building, from the plumbing to the wiring to the ventilation to the architectural blueprint... The third is that of airline pilots who know not only how to fly an airplane but also what to do when something goes wrong, or when one of several light in cockpit starts blinking. The start of the book is riveting. The writing grabs you and you can't stop turning the pages. The introduction being off with a fellow doctor describing a case about a stab wound victim with a wound that was deeper than anything they expected. There are a thousand ways that things can go wrong when you've got a patient with a stab wound. But everyone involved got almost every step right - the head-to-toe examination, the careful tracking of the patient's blood pressure and pulse and rate of breathing, the monitoring of his consciousness, the fluids run in by IV, the call to the blood bank to have blood ready, the placement of a urinary catheter to make sure his urine was running clear, everything. Except no one remembered to ask the patient or the emergency medical technicians what the weapon was. "Your mind doesn't think of a bayonet in San Francisci," John could only say. Turns out the man had been at a costume party, and the person who stabbed him after an altercation had been dressed as a soldier - with a bayonet. To take a specific example, when we think about an ICU (Intensive Care Unit) at a hospital, we somehow conjure up this vision of a person lying in a bed, with needles and tubes running from him/her to a set of monitors, and all. But above all, the vision we have is one of quietitude and solitude. It's just as if the very act of keeping the person in the ICU and running these tubes into him is all that is needed to stabilize and cure the person. We have movies to thank for this vision. But what about reality? Is it really that serene? Fifteen years ago, Israeli scientists published a study in which engineers observed patient care in ICUs for twenty-four-hour stretches. They found that the average patient required 178 individual actions per day, ranging from administering a drug to suctioning the lungs, and every one of them posed risks. Remarkably, the nurses and doctors were observed to make an error in just 1 percent of these actions - but that still amounted to an average of two errors a day with every patient. The solution lies in having checklists. One criticism that I would level is that while checklists can certainly help improve coordination and reduce avoidable errors, what is not covered at all is the fact that sometimes cultural mores can hinder and hamper error correcting behavior. For example, it has been well documented that in a tragic airline crash, the co-pilot did not warn the pilot strongly enough that the plane's altitude was higher than it should be - it was simply not done for a junior pilot to be seen correcting his senior pilot. The warning uttered by the junior pilot was more by way of a gentle and deferential question. A checklist would not have helped here. The same goes for a hospital setting too. In some cultures it may be ok for a nurse to correct a surgeon in an operation theater, but in several others this will simply not happen. The book does drag somewhat during the middle. But then picks up again. This is the author's first full-length book. His earlier two books, Complications: A Surgeon's Notes on an Imperfect Science , and Better: A Surgeon's Notes on Performance were essays on a related topic compiled into a book. Writing a full length book on a single topic is more challenging. Dr Gawande succeeds, mostly. Penguin Books India page for the book - the hardcover edition retails for Rs 399.